Marko Kostov Cepenkov or Marko Tsepenkov (Bulgarian: Марко Костов Цепенков) (born in Prilep, Ottoman Empire 1829 - 1920 in Sofia, Bulgaria) was a Bulgarian folklorist from Macedonia.. He was a writer and collector of folk literary works. His family moved to Prilep from Oreovec. His father, Kosta, lived in Krushevo for a period of time, where Marko Cepenkov was born. Since his father was a traveler, Cepenkov earned the opportunity to travel. He lived in Ohrid and Struga and visited other places in the country by the time he was fifteen. Cepenkov was educated in small Greek schools. In 1844 he moved to Prilep, where he attended the private school of Hadji pop Konstantin Dimkov and father Aleksa, for two years. He also became a tailor and while working in the shop he met a lot of people who would tell him folk stories. Cepenkov was also a good narrator and knew a lot of folk stories. Since then he became a collector of folk stories and other folk works. In 1857 Cepenkov was a teacher in Prilep. After he met Dimitar Miladinov he started collecting more and more folk works: songs, stories, riddles, and others. In that time he knew more than 150 stories and wrote one to two stories per week, as he mentions in his Autobiography. He also wrote the play Cane Vojvoda, about a dozen songs with patriotic themes, and the autobiography - "Autobiography". His collected folk works were published in ten books in Skopje in 1972.A selection of his folktales have been published in English, such as 19th Century Macedonian Folktales by the Macquarie University in Sydney in 1991. 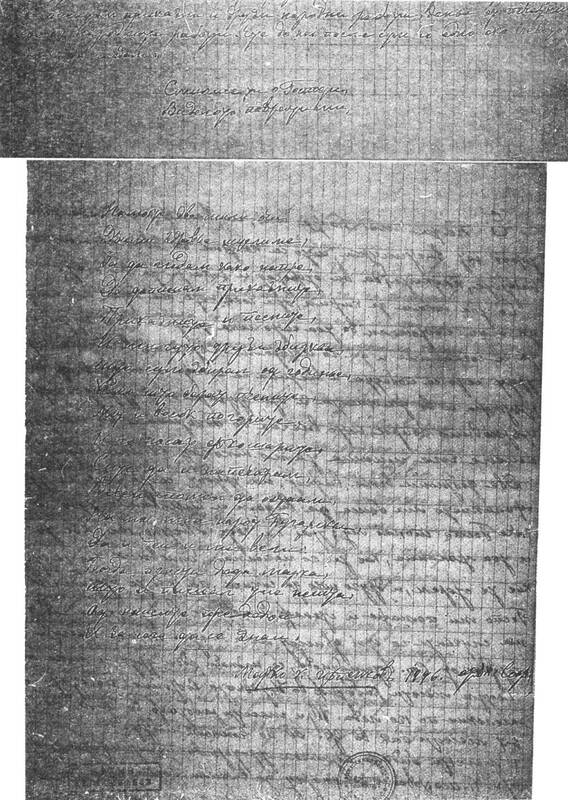 ^ Facsimile from the last poem in his "Autobiography", where Cepenкov wrote: "I will leave an etern remembrance to my kind Bulgarian nation"
Facsimile from the last poem in his "Autobiography", where Cepenкov wrote: "''I will leave an etern remembrance to my kind Bulgarian nation''"